Born and raised among a community of rice researchers in the Philippines, Kevin’s first independent study at the age of ten focused on the symbiotic benefits of intercropping the nitrogen-fixing aquatic plant azolla with cultivated rice. Kevin received his BS in Biology from Colorado College, after which he spent seven years working on a wide range of vegetable, fruit tree, and livestock-integrated farms in Arkansas, Michigan and Washington. While managing a diversified farm on the Olympic Peninsula, Kevin and his crew grew over 500 varieties of 60 different crops, including many of these for seed. Motivated by these experiences, and a desire to develop resilient varieties of under-utilized, flavorful and nutritious crops, Kevin received his MS in 2004 and PhD in 2007 from WSU in organic and perennial wheat breeding. He is now an Assistant Professor of Barley and Alternative Crop Breeding in the Department of Crop and Soil Sciences at WSU. Kevin and his team of students and researchers work on breeding and agronomy of amaranth, barley, buckwheat, oca, perennial wheat, proso millet, quinoa, spelt, and teff. He has participated in international research and extension projects in Syria, Iraq, Pakistan and Malawi, is currently coordinating an international quinoa breeding project in ten countries in collaboration with the FAO, and recently returned from a Fulbright Fellowship in his hometown of Los Baños, Philippines. Max is an Idaho native who enjoys an active outdoorsy lifestyle that includes dirtbiking, backpacking, fishing, hunting, and backcountry skiing. He is responsible for the field and greenhouse operations of the Barley Breeding Program as well as other alternative crops. He focuses on the development of varieties that are competitive with current conventional lines that are hardy in the dryland cropping systems unique to the Palouse and eastern Washington. He’s very fond of the Palouse and the unparalleled riches and opportunities it has to offer and encourages all visitors to explore the region. Cedric was born in Rwanda and graduated from the University Of Rwanda with a major in Soil and Water Management. Cedric aspires to work with farmers around the world, especially in Rwanda. He would like to use a participatory approach in engaging farmers to meet local community development needs. During his undergraduate studies, he worked for Building Bridges with Rwanda (BBR Ltd.) for five years on the project “Agricultural Food Security, Nutrition and Wellness.” He also worked for Good Neighbors Rwanda in partnership with the World Food Program in the project “Food For New Village." In the summer of 2012, he was an intern with WSU students and staff on different agricultural projects at the Covaga Innovation Center in Rwanda. Working closely with rural residents at the community level gave him opportunities to test new ideas. These experiences also prepared him for joining WSU in the fall of 2013. Cedric completed his MS with Kevin Murhpy in 2016. Currently, he is working on his PhD with Kevin Murphy. His research focuses on breeding and agronomic practices for quinoa, millet and teff production. He is also studying different intercropping systems in quinoa, irrigation regimes in millet and seed extrusion in teff. Daniel “Dan” Packer is a Research Associate managing the quinoa breeding and agronomy program within the Sustainable Seed Systems lab. His research emphasizes applied plant breeding methods for quinoa cultivar development and germplasm evaluation for the agricultural environments of the Pacific Northwest. Originally from San Antonio, TX, Dan has a BSc in Plant Biology from Brigham Young University and a PhD in Plant Breeding from Texas A&M University. As a BYU undergraduate, he was first introduced to quinoa research under the guidance of Eric Jellen and Peter Maughan and at Texas A&M, his plant breeding training occurred under the guidance of William “Bill” Rooney as part of a sorghum breeding and genetics program. Prior to his arrival with the SSSL, Dan was employed as a sorghum breeder with Ceres, Inc. in College Station, TX and Puerto Vallarta, MX developing inbred lines and commercial hybrids for biofuel applications. Originally from Wisconsin, Kristofor was a secondary school History and Political Science teacher from 2005 to 2009. He left his home state to become a United States Peace Corps volunteer in the Sub-Saharan African country of Malawi from 2009 to 2012, where he worked mainly in agroforestry and agricultural extension. 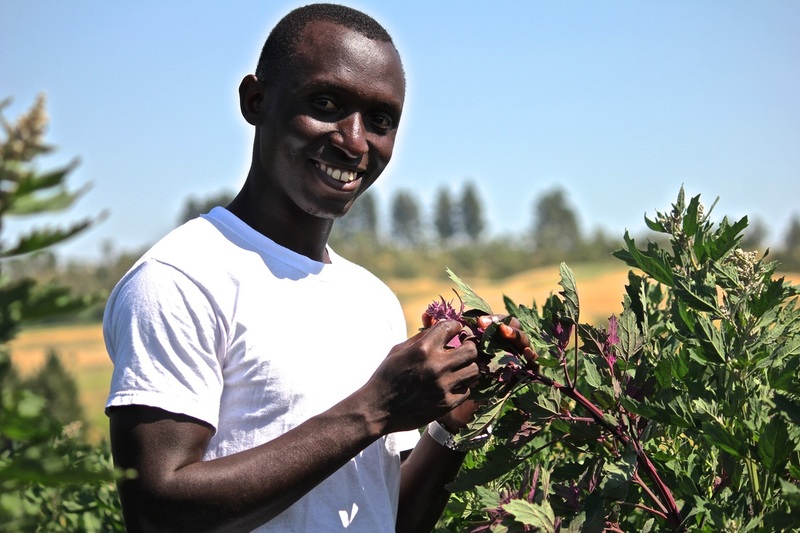 On his return to the US, he completed a second Bachelor’s degree in Organic Agricultural Systems at WSU and worked as an intern in Kevin Murphy’s Alternative Crops Breeding Program. As a research intern, he conducted a 2014 buckwheat variety trial and assisted with quinoa variety trials and quinoa population development in eastern and western Washington. Kristofor’s interests lie in the areas of plant breeding (both annuals and perennials) as well as extension work with small-scale farms and farmers, particularly in organic and alternative production systems. Kristofor obtained a Master’s degree in Crop Science from WSU in 2017. He investigated quinoa transplanting practices and weed control using weeder geese on organic production systems. Kristofor currently manages the lab's western WA trials. Halle completed her B.S. in Biology in Philadelphia, PA at Drexel University. While there she worked in the Fisheries and Entomology Departments at the Academy of Natural Sciences, and in the Bioko Biodiversity Protection Program (BBPP) studying primates and marine turtles. After graduation Halle traveled to Equatorial Guinea to take data for the BBPP. The main threat to primates and marine turtles in the area is poaching for human consumption. In many parts of the world, agriculture and hunting are primary causes for loss of biodiversity and wildlife habitat. 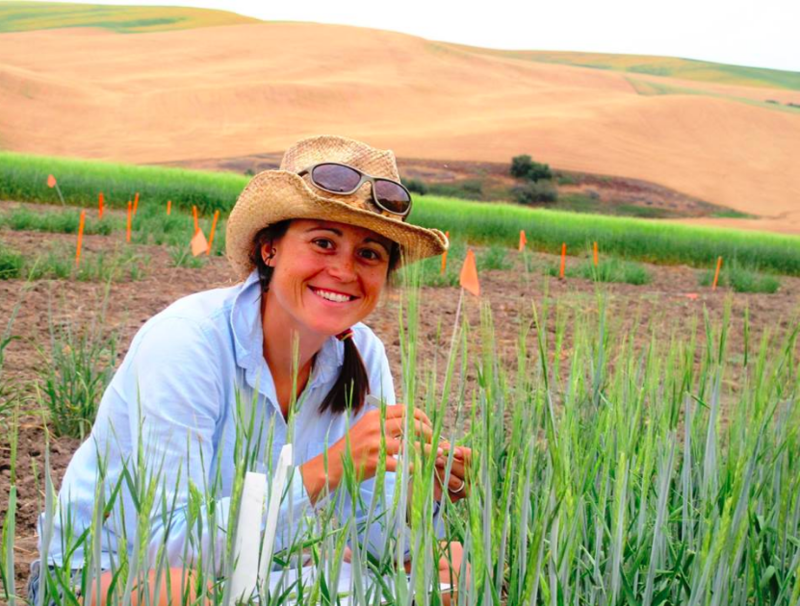 Halle's interest in biodiversity and evolutionary biology led her to research plant breeding, which is how she came to study barley and quinoa breeding in the Sustainable Seeds Lab at Washington State University. She has one project studying the effects of genotype by environment interactions on beta glucan, mineral and starch content in barley. Her other master’s project focuses on quinoa processing and its ability to improve nutritional quality in baked goods. Halle started working in the lab in May 2017 and began classes in the fall. Evan was raised in Western Pennsylvania and Madison, Wisconsin before attending Colorado College, where he earned a B.A. in Organismal Biology and Ecology, a minor in Biochemistry. He was awarded the Enderson Award in Conservation Biology for his thesis on the physiological response of saltcedar to biological control. Following graduation from CC, Evan served as an AmeriCorps member in the Student Conservation Association while working as a watershed restoration intern for the Vashon-Maury Island Land Trust. He then moved to central Florida, where he joined the Plant Ecology Program at Archbold Biological Station as a research intern. Evan assisted with data collection for long term rare plant demography studies and ecological restoration projects while conducting independent research projects on pollinator ecology and the response of Crotalaria spectabilis seedlings to water stress. 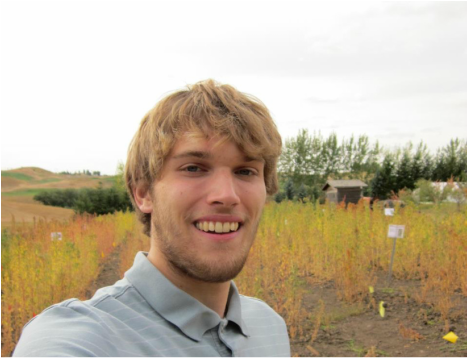 Evan worked at the Blackland Research and Extension Center as a technician on multiple switchgrass ecology, physiology, and genomics projects before joining the Sustainable Seed Systems lab at WSU. His dissertation focuses on breeding quinoa and barley for flavor and nutrition. Evan is especially interested in developing technologies for high throughput phenotyping of end-use quality traits and developing interdisciplinary collaborations. He is passionate about bridging the gap between farmers, stakeholders and consumers to support the development of regional grain economies. Evan enjoys facilitating tastings that engage the public with sensory perception of regional agricultural products. To appreciate something you must understand it, and to understand something you must experience it. Julianne grew up in central Massachusetts surrounded by small-scale apple and pear producers. Julianne received her BS in Environmental science from Colorado College, leading her to study agroecosystems in India and Thailand. Her first undertaking of interdisciplinary research was with an Indian organic tea cooperative that resulted in her undergraduate thesis, A Political Ecology of Tea in Darjeeling, India. Julianne’s global agricultural career has placed her in New Zealand, Australia, and the US working with biodynamic orchardists, regenerative ranchers, and organic farmers. In 2017, Julianne earned her MS in Crop Science at WSU with research topics including evolutionary participatory quinoa breeding and soil microbiology. After her M.S, she continued working with WSU at the Puyallup Research and Extension Center and subsequently, the Washington State Department of Agriculture. In 2019, Julianne rejoined the Sustainable Seed Systems lab to pursue an interdisciplinary PhD in Crop Science and Human Health and Nutrition. Her research efforts are focused on evolutionary participatory crop breeding, breeding crops for enhanced nutrition and low input agroecosystems, and determining human health responses to new crop cultivars. Morgan was born and raised in Coeur d’Alene, Idaho. After her work on an environmental remediation project in Nigeria with TerraGraphics Environmental Engineering, she enrolled in graduate school at Washington State University where she became deeply interested in the connection between culture and food. For her M.S. in Environmental Science, she studied the introduction of quinoa in Malawi under Dr. Kevin Murphy, evaluating the possibility of growing quinoa as a supplemental crop. She was particularly interested in understanding the social and cultural acceptance of quinoa as a potential food crop. Morgan now works as an International Outreach Coordinator for University of Idaho International Programs. Hannah grew up in the foothills of the Rocky Mountains near Nederland, Colorado. She started her undergraduate degree at Colorado State University (CSU) as a Nutrition Science major. During her first year, she took a Crop Science class, began working for the university's dry bean breeder, and started volunteering on a local farm. While working for the Dry Bean Breeding Program at CSU she became fascinated with the diversity of bean varieties. Not only are there black, pinto, white, and kidney beans, there are also purple spotted beans, pink beans, yellow beans, and beans that pop! She was so inspired by her experiences that she decided she wanted to grow food instead and this led to a change in her majors. Her fascination with plant diversity led her to WSU where she received an MS in Crop Science in May 2014. She worked with Kevin Murphy on quinoa breeding and agronomy, and was fully funded by the Seed Matters/Clif Bar Family Foundation as a Graduate Student Fellow. She was formerly a research technician in the Sustainable Seed Systems Lab specializing in breeding and agronomic practices of alternative crops in organic and conventional farming systems. Hannah is now living in Wenatchee, WA working at Stemilt in tree fruit research and development. Adam Peterson grew up in Rochester, a town in the Chehalis Valley in southwest Washington state. 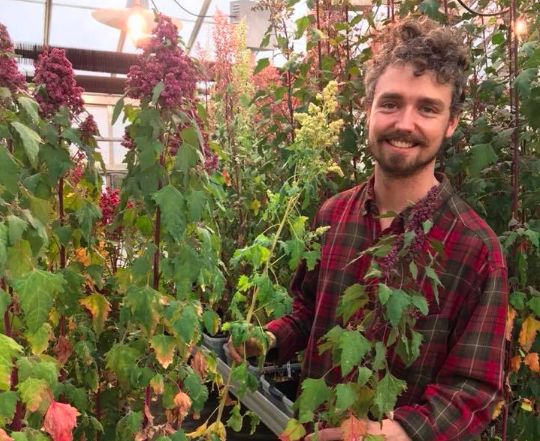 His interest in science, nature, and self-sufficiency led him to pursue studies in organic agriculture at the Evergreen State College, where he earned his BA with a focus in Environmental Studies and Sustainable Agriculture. Drawn to plant breeding as an important tool for diversifying and improving the sustainability of regional agriculture systems, he found himself drawn to the work of Dr. Kevin Murphy at WSU. Adam managed the Olympia location of WSU's first quinoa variety trials in 2010. This led to Adam pursuing a MS Degree in Crop Science the following year under Dr. Kevin Murphy. His research focused on quinoa salinity tolerance, heat tolerance, and quinoa breeding. Adam has since worked with quinoa farmers across the West Coast for Lundberg Family Farms, where he now works as a Quinoa Consultant. Thanks in part to quinoa's very particular requirements of growing environment, Adam has developed a fascination with the interaction of geography, climate, and agriculture, and will be pursuing studies in the Master of GIS for Sustainability Management program at the University of Washington in the fall of 2016. Geyang was born and raised in Baoji, China. She completed her Bachelor’s degree in Food Quality and Safety at the China Agriculture University and her Master’s degree in Food Science at the Beijing Technology and Business University. She conducted research on microbiology and enzymes for her undergraduate project and Master's thesis, respectively. 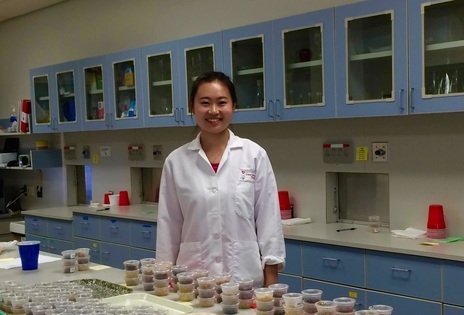 Geyang joined WSU in the fall of 2012 Geyang went on to study grain science for her PhD program, motivated by the importance of grain in human nutrition and food security. Interested in interdisciplinary research, Geyang has developed a project combining Crop Science and Food Science. 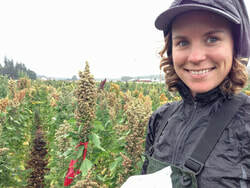 She believes that a nutritious crop like quinoa deserves to be adopted by industry and farmers worldwide, such as China and other Asian countries. Geyang completed her PhD degree in Food Science at WSU in 2016. She worked on cereal chemistry, seed quality, and sensory evaluation of quinoa. Alison was born and raised in Chicago, Illinois. She obtained her BA in Anthropology from Michigan State University focusing on Peace and Justice Studies and local food systems. She spent the last semester of her BA abroad in Durban, South Africa. After graduation, she taught English as a second language in Quito, Ecuador. After a roundabout journey throughout the United States she landed in the Pacific Northwest. In Leavenworth, Washington, she helped manage a small-scale organic farm for several years. Most recently, she taught Sustainable Agriculture at the Wenatchee Valley Community College and managed their organic garden and greenhouse. She completed her MS in Agriculture with Dr. Jessica Goldberger in 2016. Her research focused on the socio-economic feasibility and potential adaption of US grown quinoa, specifically in Washington. Kisusan is from the Himalayan Kingdom of Nepal. 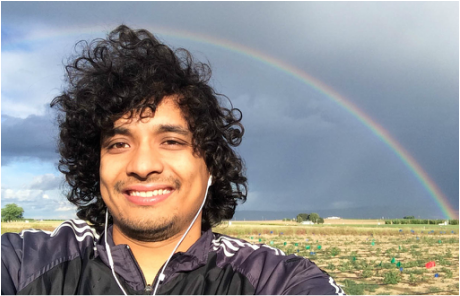 He completed his Bachelor’s degree at the Institute of Agriculture and Animal Sciences at Tribhuvan University, Nepal, with majors in Agriculture and Agricultural Economics. During his undergraduate studies, he was elected president of the Free Student Union, where he developed his leadership skills. After completing his Bachelor’s degree, he worked as a consultant for the Swiss corporation, HELVETAS. Working closely with rural farmers, he witnessed their struggles firsthand. Motivated to help rural farmers, he decided to pursue a MS in Soil Science, and joined WSU in the fall of 2013. 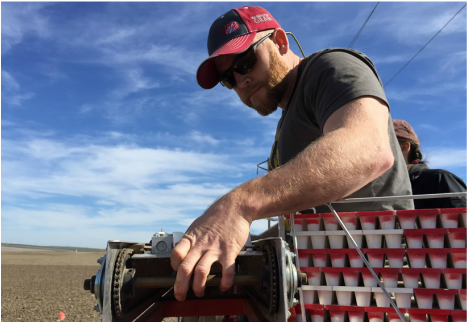 He conducted research with Kevin Murphy and Dr. Joan Davenport to evaluate different irrigation and soil fertility management regimes for quinoa in the Columbia Basin. Louisa is British-Swiss and was born and raised in Hong Kong. She obtained her Bachelor’s degree in Chinese Studies from the University of Oxford in 2006 and became interested in crops science after working in agricultural development and in organic agriculture policy. Prior to starting her graduate studies, Louisa spent three years conducting crops research for the UK’s Organic Research Centre, based on an arable agroforestry farm in Suffolk, England. There, the focus was on agricultural approaches which support high biodiversity and ecosystem health, and Louisa retains that focus in her present work. Louisa began her PhD in Plant Breeding at Washington State University in 2013. 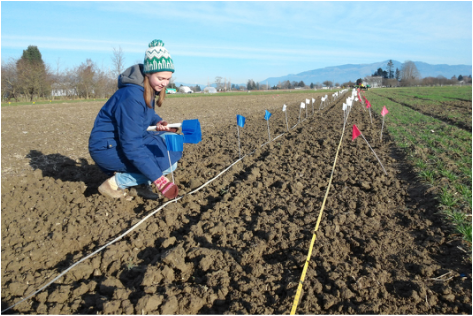 She was attracted to Washington State University by the opportunity to study plant breeding and genetics in close conjunction with end-use applications and with a strong focus on regional food and farming systems. 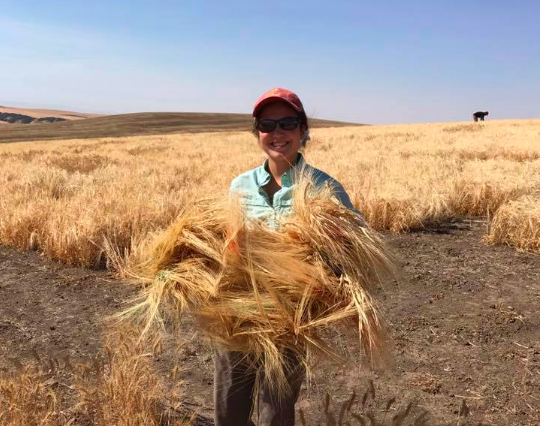 She researched development of oat germplasm for western Washington, and her work includes aspects of history, food system economics, agronomy, animal nutrition and the milling-oat supply chain. Louisa’s research was supported by a fellowship from the Seed Matters Initiative of the Clif Bar Family Foundation and additional funding from Wilcox Family Farms. Louisa completed her PhD degree in Plant Breeding at WSU in 2017. Janet grew up in Los Baños, Philippines, a university town set at the foot of a volcano, teeming with hot springs and research institutes. As a child, she helped her mother with her doctoral research in entomology, feeding and dissecting moth larvae. As an adolescent, she and her younger sister trailed after their mother in various farmers’ fields and research reviews. Thus, her path was set. 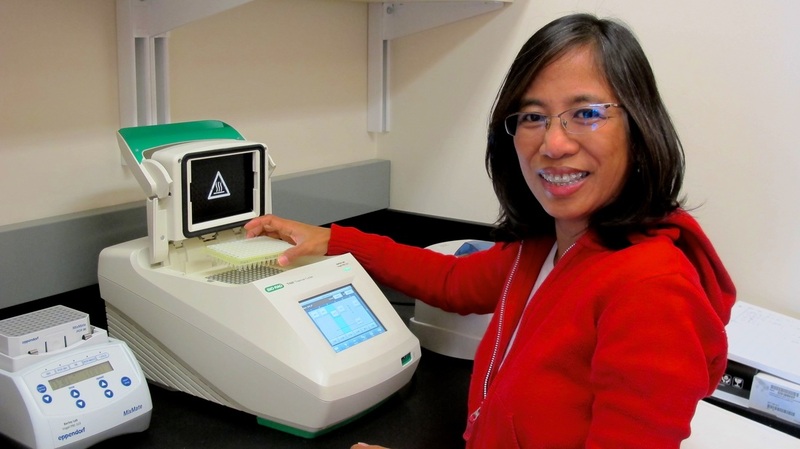 She obtained a BS in Agriculture from the University of the Philippines Los Baños (UPLB), and her first job was at the International Rice Research Institute (IRRI) where she worked on rice diseases. She then went to WSU for her MS in Plant Pathology. After this, she joined UPLB as Assistant Professor in Plant Pathology. After several years teaching college courses, Janet went back to WSU and obtained her PhD in Plant Breeding and Genetics. Janet was the Sustainable Seed Systems Lab research associate working on marker-assisted selection for food and malting barley. She was involved in the development of herbicide-resistant barley and high lysine barley through mutation breeding. Janet is also a technical editor, and has co-edited a book on quinoa with Kevin Murphy. 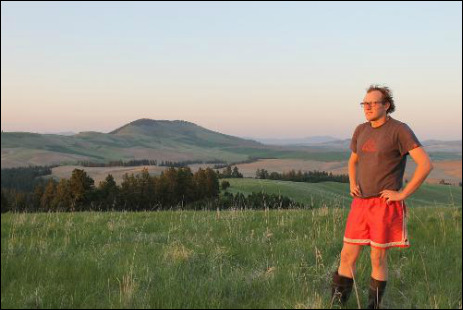 Ian was raised on a Palouse wheat farm where he is now the fifth generation to farm that land. He traveled far from home to receive a BS in Biology from the University of Canterbury in New Zealand, and learned of the benefits of pasture and perenniality within an agricultural system. He has since worked in various agricultural systems from roses to ryegrass. These experiences demonstrated how diverse agriculture and it's problems can be. He has also been involved in different research projects involving ecology and agriculture. He has worked as a research technician as well as a research intern for projects with WSU's Center for Sustainable Agriculture and Natural Resources including research looking at the carbon footprint of organic farms and and livestock integrated farming. Comparing a natural system to the highly altered system seen on a farm has been very transformative in how Ian observes 'a good crop'. As a long term goal, he aims to blur this line between ecology and agriculture. 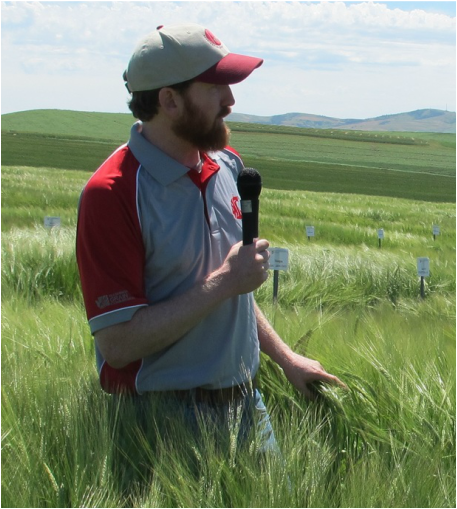 Ian pursued an MS degree on the continued development of perennial wheat, which he has long heard of the potential for as a crop in the Palouse. Of particular interest to Ian is the potential to protect and restore soil after generations of erosion from annual cropping. Ian completed his MS in Crop Science from WSU in 2017. Leo was born in Ecuador and grew up in a small town near Quito. His passion for nature encouraged him to study Agronomy. He obtained his Agronomic Engineering degree in Ecuador where he studied the behavior response of several varieties of potatoes to drought in a greenhouse. He was hired by the Research Institute of Agronomy in Ecuador to work with cereal crops. Afterwards, he earned a Master's degree in Spain in Environmental Agrobiology by means of an international scholarship. When he came back to Ecuador, he worked for the United Nations World Food Program for two years in humanitarian aid. He received a scholarship from the Ecuadorian Government to pursue a PhD degree. In 2013, he met Kevin Murphy at the IV Global Congress on Quinoa in Ecuador. He joined WSU in the summer of 2014 and began his doctoral research focusing on breeding quinoa for heat stress tolerance. 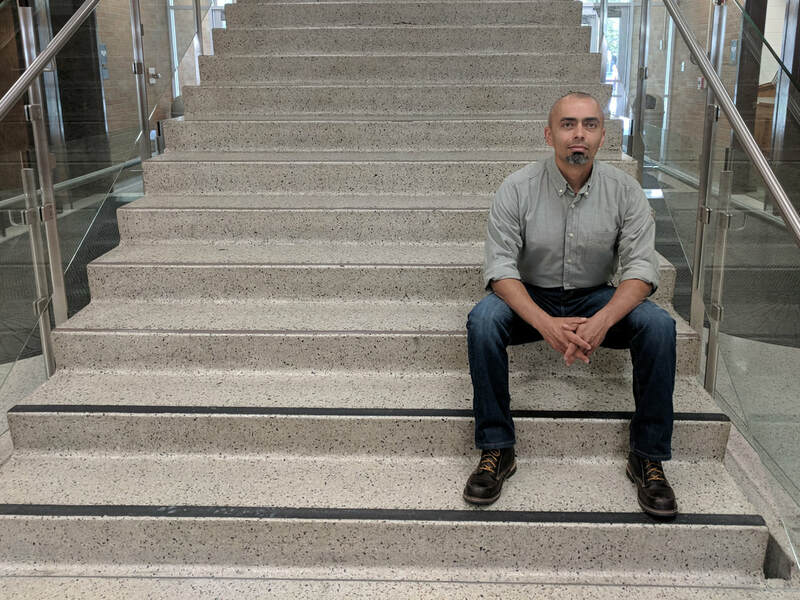 Leo completed his PhD in Crop Science from WSU in 2018.